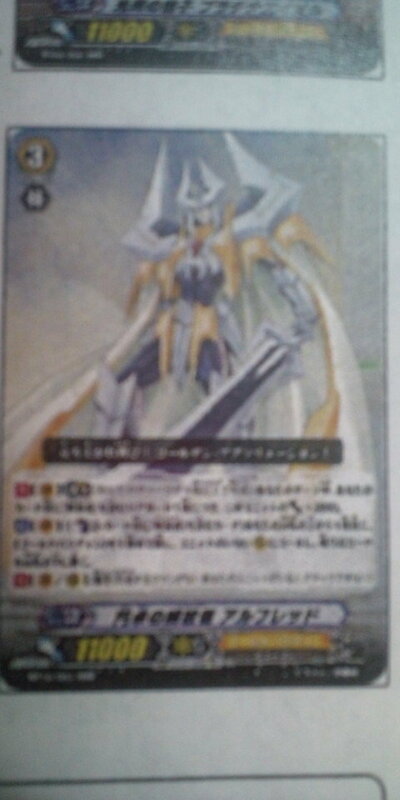 Activate【V/R】 : [Counterblast (2) cards with "Liberator" in their name] Look at up to 1 cards from the top of your deck, search for up to 1 《Gold Paladin》 among them, call it to an open rearguard circle, and put the rest of the revealed cards on the bottom of the deck. Update: Clearer images have since clarified that Alfred only looks at the top 1, not the top 3 as previously thought. Liberator of the Round Table has drawn considerable attention as the definitive, new Gold Paladin with Gancelot as his backup. Alfred answers most of the problems surrounding both Ezel and his original incarnation as the King of Knights; a strong base 11000 power simultaneously protects him and allows him to hit 21000 power independently, doing this even prior to limit break with Llew's assistance, and once he does hit limit break he can reach a consistent 31000, again with Llew's aid. The especial counterblast restricts him from being used in traditional Gold Paladin decks, but his base power lets him become a strong rearguard not reliant on a specific booster. 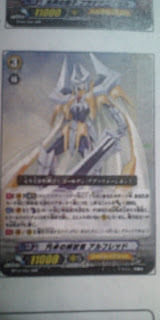 With the Gold Paladins' rearguard focus and this card to bring a cohesive strategy to the fore, Alfred has become the subject of much excitement regarding the end of the crossride format in Japan and the soldification of a strong identity for Gold Paladin that can compete with their ever-strengthening Royal predecessors. Images previewing BT10 have shown a box design patterned off of BT01: Descent of the King of Knights, with the new Alfred featured on the front and Dragonic Descendant on the back. Both Alfred and Blaster Blade Liberator are being illustrated by Itou Akira, the franchise's overall creative influence and primary author, who was also responsible for the original Blaster Blade and both Alfred designs. 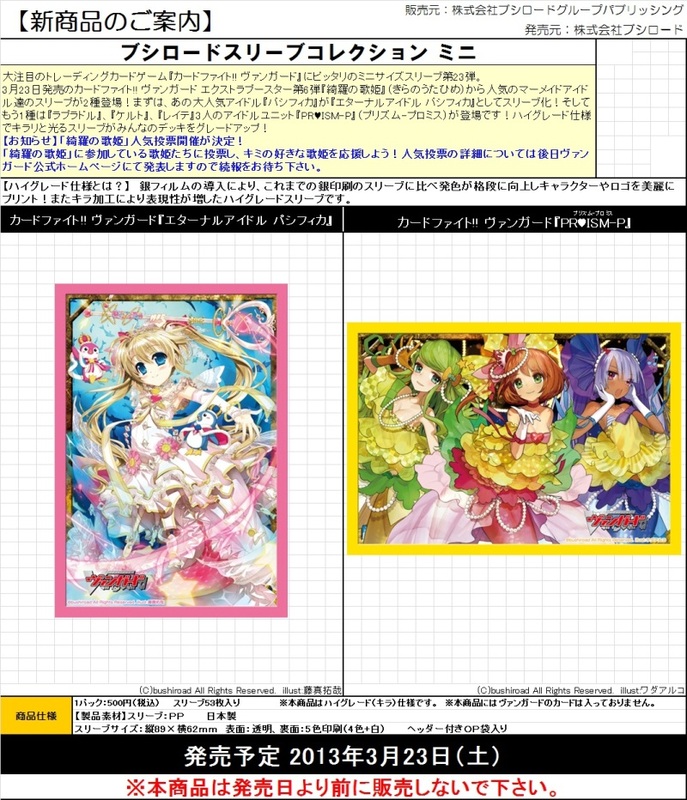 In other news, image mockups for the next round of official sleeves have revealed that Misaki will not be using Oracle Think Tank for the duration of Link Joker, but that her new cards from a new clan altogether, Genesis. Of the Genesis cards so far revealed, their main grade 3 is known to be War Goddess of the Moonlit Night, Artemis, based on Artemis the Greek god of archery and the hunt, while the only other Genesis card revealed is unknown, but appears to be patterned on more Japanese motifs. Reactions are mixed as all deck changes thus far in the franchise are generally held to be mishandled by fans, but it appears that with the major Shinto deities exhausted on the OraThin side of things, Bushiroad has chosen to create a new clan for the Greek pantheon. Artemis has been illustrated by Azusa, who previously illustrated Battle Sister Ginger, Cup Bowler and Sacred Guardian Beast Nemean Lion, among other cards. On the Bermuda Triangle side of things, Eternal Idol, Pacifica was recently revealed in the same capacity as Artemis, but what kind of card she will be is not yet known. She will be receiving her own sleeve, and some have taken her prominent resemblance to Sendou Emi as a sign that Aichi's younger sister may become a larger figure during Link Joker, as she was previously used to advertise EB02 during the first season. EB06: Dazzling Divas is due for a March 23rd Japanese release and a July 2013 English release, updating Bermuda Triangle for the modern scene. Eternal Idol is being illustrated by Takuya Fujima, who was also responsible for the original Pacifica's artwork, and is otherwise known for his work with the Magical Girl Lyrical Nanoha ViVid manga. The product page for VGE-BT05: Awakening of Twin Blades has revealed that there will be 82 cards in the set and with 22 Rares, 2 more than was present in the Japanese set. Past booster sets have introduced a practice of integrating cards that were promos in their original Japanese release into main sets for their English release. Current speculation is that one of these promo cards may be Creeping Dark Goat, a Shizuku-type Shadow Paladin first vanguard that has been very popular in Japan as a replacement for Fullbau and the Blaster evolving line.